Our household has several iPads and iPhones. I use my iPad all the time to surf the web, reply to emails and view my Twitter stream, among other things. 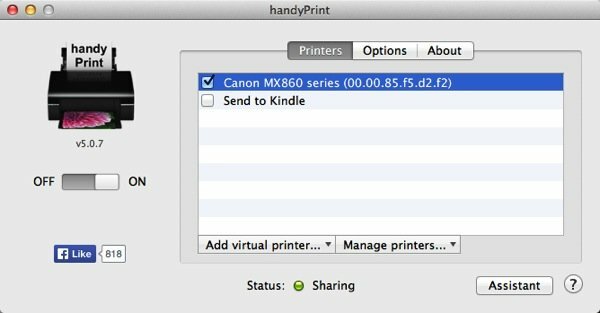 ?Occasionally I find it would be nice to print from the iPad, since it has AirPrint and all, but our Canon MX860 printer doesn?t support AirPrint. handyPrint? v5 is a 64 bit Mac OSX application that allow you to print from your iPods, iPads and iPhones on printers that do not support the AirPrint protocol. v5 has been re-designed as a standard application similar to the ones you would find in the Apple App Store. You simply copy it to the Applications folder and run it from there. Once you turn the application switch to ON it will start on its own every time you login to you user account. No need to manually start the application. handyPrint is a simple download which is a DMG, just click to install. ?It?s an application needs to be running while the user is logged in on the host Mac. ?I noticed there?s a Pro version that runs as a service to alleviate this requirement but this didn?t matter to me. 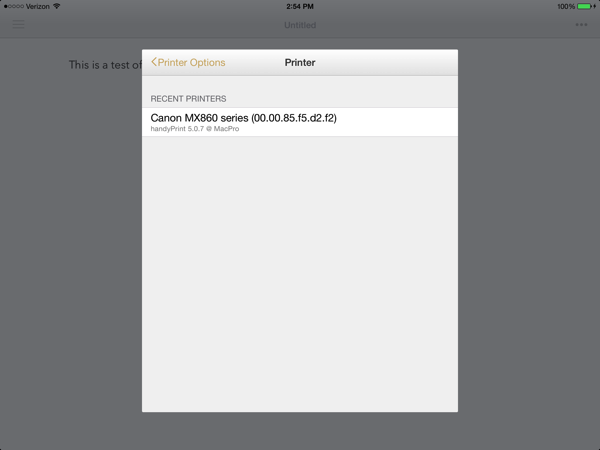 A list of available printers shows up and you just select the ones you enable AirPrint support. ?This particular printer is actually wireless, I just happen to have the driver installed on my Mac. Select the printer and that?s it. ?handyPrinter works seamless. Thanks to Eric Davis for pointing it out on Twitter. ?